Sailmah and Riaz’s destination wedding at the St Regis Saadiyat Island Resort in Abu Dhabi was a beautiful prelude to their life long journey! Salimah and Riaz’s beautiful beach wedding was a celebration of their love, traditional customs, and elegant design aesthetics. A union of love and fortitude, Salimah and Riaz’s relationship pans over 10 years. 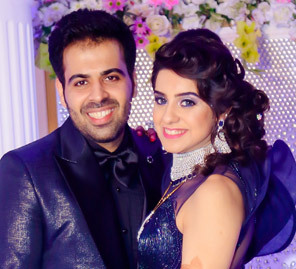 Their weddings story was created by BAQAA to signify their true love. BAQAA Glamour Weddings & Events, Dubai, UAE was selected by the couple because it breathes and delivers what it stands for- subsistence and permanency. It is the summit of the mystical manazil, which is the destination wedding or the abode. The company specializes in inbound and outbound destination weddings and are often applauded for the passion they put into every wedding detail. The founder, Designer and CEO, Rachna Chadha highly recommended St Regis Hotel on Al Sadiyaat Island, Abu Dhabi for its deep turquoise blue waters, a well-reserved beach, grand ballroom, and interesting outdoor spaces to design back to back events for over three days. The wedding was attended by guests from all over the world, who gathered in Abu Dhabi to celebrate their holy union to witness this luxury wedding. The first event was the haldi ceremony which was an afternoon of customs and blessings. A concept was created with minimalist elegance using an ivory and yellow color palette. 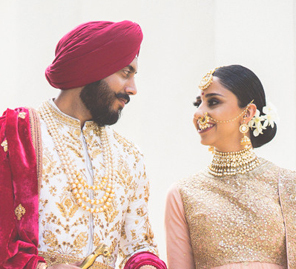 The centre stage was decorated with jasmines, pastel pink and yellow roses, thus evoking purity and ethnic glamor. For the sangeet, subtle accents from Moroccan and Turkish cultures were taken and infused with lively Middle Eastern color schemes. The event was decorated with soft drapes, decorated lamps, candles, warm amber and red lighting along with Turkish chandeliers specifically customized for the occasion. To match the glitzy décor, Salimah wore an embellished purple and gold outfit which made her look gorgeous. It was a night to remember, as the family and friends danced and indulged in lip smacking Middle Eastern delicacies. 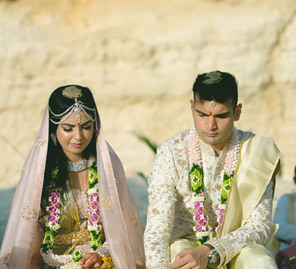 Both Riaz and Salimah wanted a memorable beach wedding. BAQAA created an all-white, pristine and soft décor to blend into the untouched beach of Al Sadiyaat. The nikaah mandap was simple yet beautiful with soft accents of pastel flowers and chandelier. Two young violinists serenaded the guests with some melodious tunes as the parents of the bride escorted Salimah towards the mandap. The ceremony was serene and deep with beautiful words shared by the Priest and brother of the bride. 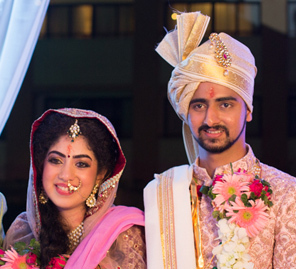 Salimah looked every bit of a blushing bride in a light lavender grey Anarkali which she accessorized with a stunning silver and pearl embroidered veil, while Riaz looked handsome in a plain white brocade sherwani. The Nikah ceremony was followed by a sumptuous lunch on a sprawling terrace overlooking the ocean. The guests were blown away by the all-white customized marquee, stylized furniture, flower arrangements which were made like a new crop of flowers- signifying the beginning of a beautiful journey of the lovely couple. The décor was further accentuated with lush flowers hanging from the ceiling of the marquee which even had a separate photo op area with their initials made with florals. The union was celebrated with instrumental music by a saxophonist, pianist and a live singer who filled the air with Bollywood melodies and made the afternoon even more elegant and memorable. The Wedding reception was held at the grand ballroom of the hotel. It was a grand celebration which was executed with utmost grandeur and aplomb. The ballroom décor had a WOW factor with tall Magnolia trees, lace, lots of hanging pearls, candle globes and glitters along with fresh exotic flowers. The entire evening exuded romance, beauty and feminine charm. This was further accentuated with a stage that had the guests in awe! The lighting over the tree on the stage was designed to create a dreamy ambiance of snowflakes falling down as the wedding was hosted over Christmas and New Years. The table arrangements were in two styles- high and low, with an abundance of exotic flowers and each chair accessorized heavily with lace. The couple table had brighter flowers to wish the couple a brighter beginning.